Murrieta Hot Springs is a 55+ community in Southern California. This well-established active adult neighborhood contains 1,040 homes that were developed between 1971 and 2014. Murrieta Hot Springs, also referred to as The Knolls, is made up of three separate neighborhoods: Spring Knolls, Golf Knolls, and Warm Spring Knolls. While each section has its own clubhouse and set of amenities, residents of Murrieta Hot Springs are free to enjoy the other clubhouses as well. Murrieta Hot Springs is located in the highly desirable city of Murrieta, California, which enjoys a pleasurable year-round climate that allows for outdoor activity no matter what month is on the calendar. This community is also conveniently located across the street from restaurants, stores, and gas stations, making Murrieta Hot Springs a very convenient active adult community in Southern California. Homeowners within Murrieta Hot Springs have three clubhouses at their disposal. The Golf Clubhouse, located along the northern side of the community, has an exercise room for staying in shape as well as a card room. Outdoors, there is a beautiful pool and a patio. Residents can challenge each other at the horseshoe pit or enjoy a casual get together in the picnic area. The community also has walking and biking trails that weave throughout Murrieta Hot Springs. The Spring Knolls Clubhouse, located in the middle of the community, is the largest of the three. This clubhouse has an exercise room as well as a multi-purpose room for club meetings. Residents can join a game in the card or billiards room. Outdoors, the Spring Knolls Clubhouse has two outdoor pools, a patio, three shuffleboard courts, and horseshoe pit. The Warm Spring Knolls Clubhouse, while the smallest of the three, still has several amenities to keep homeowners active. A meeting room is available indoors, while outdoors there is a pool, patio, picnic area, and even a dog run for your four-legged friend to get some exercise. Between the three clubhouses, residents will never lack in ways to stay busy. Murrieta Hot Springs was developed between 1971 and 2014 and upon completion contained 1,040 low-maintenance single-family homes. Ranging in size from approximately 960 to 2,646 square feet, these homes have two to four bedrooms, one to three-and-a-half bathrooms, and an attached carport or two-car garage. Many of these homes are custom built so features vary, but some contain large kitchens, covered patios, plantation shutters, laminate and tile flooring, sun rooms, and breakfast nooks. Murrieta Hot Springs is constantly buzzing with physical recreation and social interaction. Getting into shape is fun with groups like aquacise and line dancing. Join a game of cards, bunco, hand and foot, or Bingo. Special interest groups include women's society, ladies' tea, and Bible studies. With holiday parties and high society night, meeting new neighbors is always easy. Murrieta Hot Springs makes sure that there is always something on your calendar. Murrieta Hot Springs is located in the Southern Californian city of Murrieta. 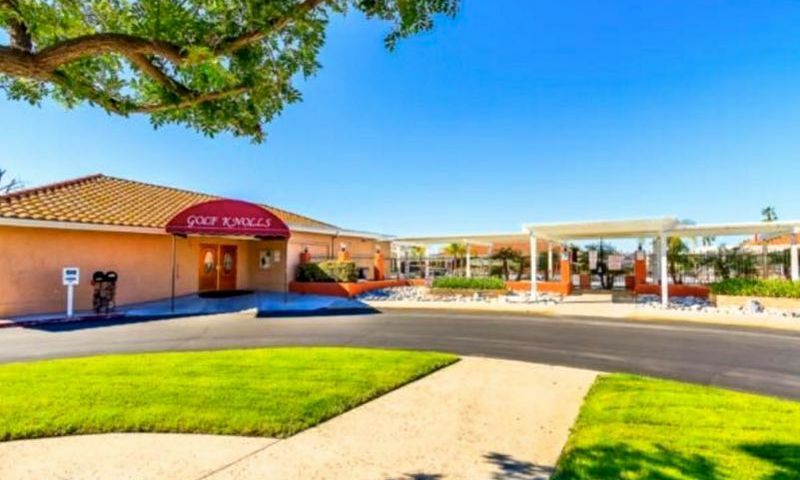 Just outside of the community are several stores for everyday needs like fast food restaurants, gas stations, and a Goodwill, while a little farther down the street is Murrieta Town Center and Rancho Springs Medical Center. Interstate 215 is just a couple minutes away and will get you around town, while for farther travel, the Palm Springs International Airport and John Wayne airport are about an hour-and-a-half away. There is plenty to do in the Murrieta, CA area. For outdoor recreation, residents have easy access to Warm Springs Park and Preserve, Rancho Santa Rosa, and Santa Margarita Ecological Preserve. The Golf Club at Rancho California is next door and the area also hosts California Oaks Golf Course and Bear Creek Golf Club. For big-city entertainment, Los Angeles and San Diego are less than two hours away. Murrieta Hot Springs is an exciting active adult community to call home in the Inland Empire area of California. The Spring Knoll Clubhouse is located at 38441 Via La Paloma and has plentiful outdoor amenities for residents to utilize. The Warm Spring Knolls Clubhouse is the smallest of the three amenity centers and is located at 38145 Via Del Largo. There are plenty of activities available in Murrieta Hot Springs. Here is a sample of some of the clubs, activities and classes offered here. Murrieta Hot Springs was developed between 1971 and 2014 and upon completion contained 1,040 single-family homes. Ranging in size from approximately 960 to 2,646 square feet, these homes have two to four bedrooms, one to three-and-a-half bathrooms, and an attached carport or two-car garage. Many of these homes are custom built so features vary, but some contain large kitchens, covered patios, Plantation shutters, laminate and tile flooring, sun rooms, and breakfast nooks. Please Note: Floor plans are not available at this time. 55places.com is not affiliated with the developer(s) or homeowners association of Murrieta Hot Springs. The information you submit is distributed to a 55places.com Partner Agent, who is a licensed real estate agent. The information regarding Murrieta Hot Springs has not been verified or approved by the developer or homeowners association. Please verify all information prior to purchasing. 55places.com is not responsible for any errors regarding the information displayed on this website.